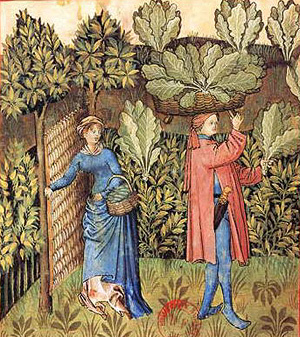 "Harvesting Collards" from the 14th c. Tacuinum Sanitatis. Collard greens give color to the Hearty Tuscan Bean Stew. In last month's article on how to plan a balanced feast or war kitchen I explained the reasons for serving a balanced meal and included several charts to help you calculate the amount of food you will need to purchase. In this article I will show how I used the charts to plan a medieval luncheon feast for 200 people. A Plowman's Feast is made of hearty dishes that can be eaten out of hand, and usually includes sandwiches, meat pies, cheese cubes, sausages, bread, fruit, and cookies. 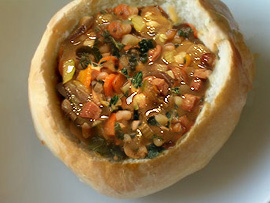 I wanted to provide more interesting choices, so I decided to serve Sourdough Bread Bowls with Hearty Tuscan Bean Stew, Individual Macaroni and Cheese Cups, Zucchini Quiche Bread, Kielbasa, Fruit Pies, and Mini-Muffins made with berries and dried fruit. First, I opened the Feast and War Kitchen Estimator (an MS Excel file) and saved it to my hard drive. Then I opened the Feast and War Kitchen Estimator file on my computer and changed the numbers of Lords and Ladies attending the feast to 100 each for a total of 200 people. Because I was planning a luncheon, I put "50%" in the percentage of daily calories. Luncheons can run from 30% to 60% of daily calories. Since I was not planning for a war kitchen, I put "0" in the other blanks. That gave me a set of serving totals in the row for feast under each food group. I saved the spreadsheet with a new name, "Plowman's Lunch," so that I could find it again easily. or berries and colored with saffron. The recipe is below after the article. Next I needed to translate the number of total servings into purchase sizes of each food item I would need to buy. For example: 20 servings of grain equals a 24-ounce loaf of sliced sandwich bread; or, one pound of dry pasta equals 16 servings of grain. Under the bottom section of the spreadsheet that is called Shopping List I deleted all the numbers in the pink "QTY" column. Then I filled in the quantities that I could estimate easily. Since a bread bowl is roughly equal in weight to a large bagel I changed the words "large bagels" to "bread bowls." Since I buy bread bowls in six-packs, I divided 200 bread bowls by six to get 32.75 for the number of packs to buy. I round that number down and put 32 under "QTY" because I figure not all people will eat soup so 192 bowls should be enough. If you can't find bread bowls at your supermarket you can contract with a local bakery to make them. Ask for 3 to 4 ounce sourdough rolls. You will need to cut the tops off and scoop out the insides just before serving. Each bowl will hold four to six ounces of stew which is smaller in size than the ones that you see at Renaissance Fairs. The Zucchini Quiche Bread is made from crescent rolls. Each tube of crescents makes 8 servings not 12 so I changed "1 dozen rolls" to "1 tube cresent rolls" and edited the formula in the "Grain" column to read "=B25*8" not "=B25*12." I put "24" in the pink "QTY" column for two dozen tubes of cresent rolls. Each recipe takes two tubes of crescent rolls and makes about 16 full-sized portions or 30 to 32 appetizer-sized portions. I planned to buy mini-muffins (one quarter the size of large coffee-shop style muffins) so I changed the formula in the "Grain" column to reflect only one serving per muffin (or, 12 serving per dozen mini-muffins). I also removed the formulas for "Fat" and "Sugar" from the muffin row since the mini-muffins are less rich. I compared the the number of servings at the bottom of the "Grain" column of the Shopping List with the number of servings I needed and saw that I only had 72 more servings of grain remaining. That was not going to be enough! I had to make a decision. Each slice of double-crust fruit pie containes one serving of grain; so, even if only half of the people ate pie—or all of them only ate half-size portions—I was still going to go over my limit, and I hadn't even added in the little Macaroni and Cheese Cups. So I looked for ways to cut down the grain servings. If I made only single-crust pies I could cut the servings of grain in each pie in half. I edited the formula in the "Grain" column, changing the "8" to "4." I figured that I would need 16 pies so I put 16 in the "QTY" column. I also decided to reduce the number of tubes of crescent rolls from 24 to 18. I made a note to cut each recipe of Zucchini Quiche Bread into 30 pieces. That meant that I would have 270 portions even though the number of servings of grain went down. For the Macaroni and Cheese Cups I put 6 pounds of pasta in the QTY column. Normally, that would only make 96 full-sized helpings. 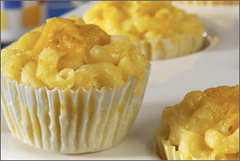 However, I planned to bake the casseroles in muffin cups and make 200 four-ounce sized portions. That made the calculated total "1088" servings of grain which was close enough to the goal total of "1050" that I was satisfied. I continued thusly through all the food groups in the menu. When I was done, I found that I didn't have enough fruit or vegetables, so I increased the vegetables in the stew, replaced some of the broth with vegetable juice, and decided to serve the Kielbasa (smoked sausage) on skewers with grilled peaches and pineapple. I also needed more dairy and protein, but I didn't want to add more cheese or meat since they are both expensive per serving. I decided to replace the liquid in the pear pies with one cup of cream plus 4 eggs to make them into fruit custard pies (or Daryoles as they were called in the 16th century). Daryoles also take less sugar than plain fruit pies, another good reason for the change. Here is my finished Plowman's Luncheon Spreadsheet. The menu that I have planned will provide about 29 ounces (nearly 2 lbs) of food per person so, even though the portions are small, there are so many dishes, the whole meal provides plenty of food. This menu also provides enough variety to please every guest. I took my shopping list of foods to Safeway.com and used their excellent shopping list to help me compile a fairly predictable budget for the whole luncheon that could be submitted to the budget committee. It looks like I will be able to create the whole feast for under $4 per person. If the event organizer decides we also need to provide paper goods and plastic cutlery, the final price will be closer to $5 per person. The table Average cost per serving illustrates the relative costs of the different food groups. Cheese and fish are even more expensive per serving than meat or eggs so keep this in mind when planning your feasts. 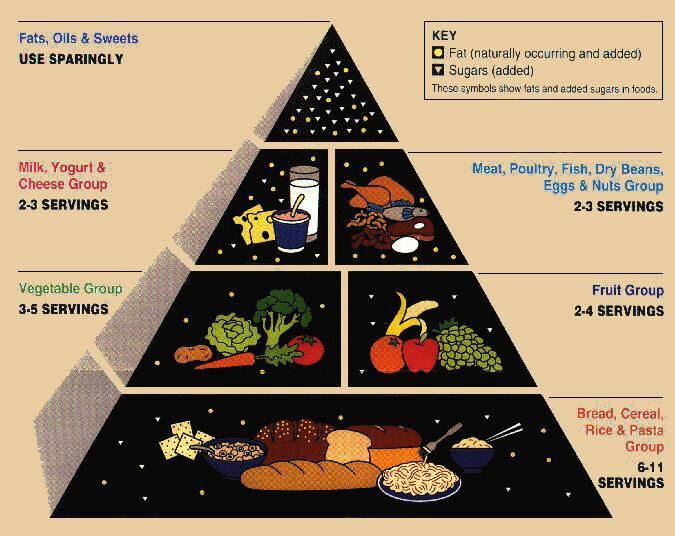 You can see that balancing the food groups is also financially beneficial. Here is a French twist on Stomboli (Stuffed Bread). Technically a crust-less quiche is a frittata; but, I like the name "Quiche Bread" better. This makes a great Christmas Brunch item or you can cut it in smaller pieces for appetizers. Preheat oven to 350º F. Press grated zucchini between paper towels to remove excess moisture. Fry minced bacon in a pan or enameled Dutch oven. (Use olive oil for frying instead if you want to make it a meatless dish.) Drain most of the grease off the bacon and sauté onion with the cooked bacon until transparent. Add the zucchini and green onions (or chives). Cook until most of the moisture is gone and zucchini begins to stick together. Transfer the cooked vegetables to a buttered 10" casserole dish. Spoon the ricotta cheese over the zucchini mix. Sprinkle the grated cheddar cheese on top of ricotta cheese. Hold the Parmesan cheese for later. Put eggs and milk in a bowl and whip with a whisk until lemon yellow. Set aside ¼ cup of egg mixture and season the rest with salt and pepper. Carefully pour the egg mix over the cheese and zucchini layers. Bake for 1 hour or until set and slightly puffed and brown on top. While quiche is cooking, cut up the bell pepper and place slices on a cookie sheet. Brush with oil. Roast in the oven with the quiche during the last 30 minutes. Cool quiche and peppers on a rack for at least 30 minutes or refrigerate. This can all be made a day a head of time. Preheat oven to 350º F. Open the two tubes of crescent rolls and rub each sheet with softened butter. Flour a large pie sheet (a piece of tight canvas about 24" square) and a rolling pin. Stack the squares of perforated dough into a billet on the pie sheet in such a way that you are not lining up the perforations. Roll the billet out into a 10" by 20" long rectangle about ¼" thick. Transfer the bread dough to a parchment lined cookie sheet. 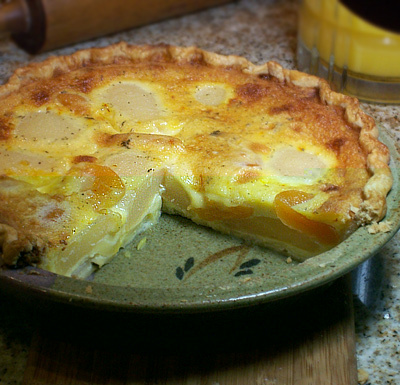 Begin assembly by cutting the cooked and cooled quiche in half. Place the two halves of the quiche in the center of the dough leaving two inches of dough at each end and 3 inches on each side. Cut the quiche to make it fit as needed. Arrange strips of roasted red pepper on top of the quiche. With a wooden spoon make a crease down the center of the quiche all the way to, but not through, the dough on the bottom. Brush the edges of the bread with reserved egg mixture. Fold the sides into the center, pinch closed, and press the center into the crease. Fold over the ends and pinch closed. 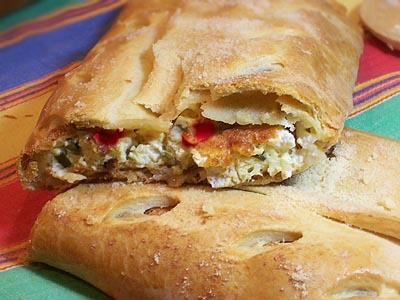 Brush the whole loaf of stuffed bread with the reserved egg mixture and sprinkle with Parmesan cheese. Cut vent holes in the top. Bake until browned and puffy in the oven. Allow the loaf to cool 10 minutes before cutting it into one-inch slices. Makes 16 regular sized servings or 30 appetizers. For dietary calculation each recipe equals 16 servings of grains, 4 vegetables, 0 fruit, 6 or 8 meat (depending on whether you use olive oil or bacon), 5 dairy, 1 fat, and 0 sugar. Variations: The loaf can also be formed into a ring. Cook the quiche in a square or rectangular casserole dish. Divide the rolled out dough lengthwise into two 6" by 20" pieces. Cut the quiche into pieces 2" wide and place in the center of each strip of dough. Fold and seal each long loaf. Do not seal the ends. Arrange the long loaves into a ring on a parchment lined cookie sheet with the ends touching and pinch them together. Brush with egg wash and sprinkle with Parmesan cheese. Cut decorative vents in the top. Cool before serving. For storage, cool completely before wrapping in foil or plastic. Reheat unwrapped in a 300º F oven. Daryoles (dah*ree*YOH*lees) is named after the yellow color of the saffron custard and reliably dates back to early Tudor times. This is a fall version of the Daryoles in my Campfire Recipes article. Cut the butter into the flour with a pastry blender. Sprinkle in the water taking care to only use as much as you need to form pliable dough. Flour your hands, a pastry cloth, and a rolling pin thoroughly. Pat the dough into a circle and place in the center of the cloth. Roll the dough from the center outward in even strokes, taking care not to roll the edges thin, turning as you go to form a 14" circle. Fold in half once, then twice, and transfer to your deep dish pie pan. Place the point in the center of a deep dish pie pan and then unfold. Cut the ragged edges off and flute the edge of the pie crust (or press with a fork). Prick to prevent puffing, and pre-bake the pie crust using pie weights (or beans) in a hot oven (400º) for 8 minutes or until hard but not browned. Remove pie weights and cool the pie shell while preparing the filling. ½ cup dried apricots, plums, raisins, or other dried fruit. 1 29-oz can pears, drained. Soak the dried fruit in warm water for 30 minutes. Beat eggs and sugar together; then the other liquids and spices, and flavoring to make custard. Drain the canned pears and the rehydrated dried fruit. 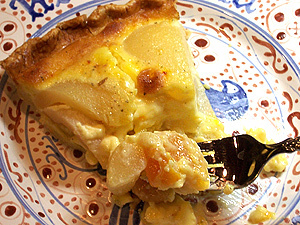 Line the pie shell with the canned pears and rehydrated fruit. 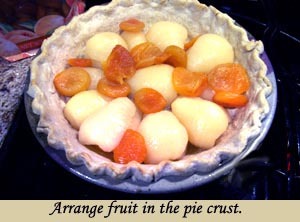 Pour custard over fruit and bake for 30 minutes at 350º or until it is all puffed up and browned. Cool completely before cutting. Each pie makes 8 full-sized portions, but can be cut into smaller slices. For dietary purposes each pie provides 4 servings grain, 4 servings meat, 1 serving dairy, 8 servings fruit, 8 servings fat, and 8 servings sugar. Variations: Instead of canned fruit you can use fresh washed and drained berries flavored with a pinch of ground cloves, cinnamon, ginger, mace, or nutmeg, etc. You can also use peaches, clementines, prunes, quince paste, dates, nuts, and herbs like chopped candied ginger, angelica, anise, basil, or anything else that pleases you. that can be traced back to 13th century Italy. Macaroni was mentioned in recipes and kitchen inventories as far back as the 13th century. Macaroni and cheese dishes were popular in Renaissance Italy. They were often made with dry grated cheese, similar to Parmesan cheese, and flavored with cinnamon, sage, or other spices. This recipe takes a new twist on an old favorite by using sharp cheddar cheese and adding a little touch of creamy horseradish for an extra flavorful sauce. I've also taken the liberty of cooking individual servings in paper muffin cups to make them easier to serve. I've also made this dish in lasagna pans, cut it into squares and served it cold to a large crowd. They absolutely loved it. But what's not to like! Topping: In a bowl combine breadcrumbs, ¼ cup melted butter, and Parmesean cheese, and set aside. Pasta: In a large pot bring 4 quarts of water to a boil then add salt and pasta. Cook, stirring occasionally, until al dente. Drain pasta in a colander, reserving 1 cup of hot water. Pour pasta into a very large bowl or pot and toss with hot water and olive oil to keep it from sticking together. Cheese Sauce: Prepare sauce while pasta is cooking. Melt 1-½ sticks of butter over medium heat in a very large saucepan or enameled Dutch oven. Stir in onions and sauté 3-5 minutes until softened. Whisk in flour and cook 1 minute, whisking constantly. Gradually add milk and cream and bring just to the point of boiling, whisking constantly. Reduce heat and simmer, whisking often, until the sauce slightly thickens, 4–5 minutes. Whisk in mustard, horseradish, paprika, salt, and pepper. Add shredded cheese a cup at a time and stir until melted. Remove pan from heat. Drain macaroni again and gently fold in the cheese sauce. Spoon mixture into paper muffin cups set in muffin tins and top with panko mixture. Bake 25–30 minutes until cheese is bubbly and top begins to brown. Do not over bake. Remove from oven and let rest at least 10 minutes before serving. Also good served cold. Makes 4 dozen 4-oz servings. Each recipe is equal to 40 servings of grain, 6 servings of vegetable, and 20 servings of fat. Variations: Substitute cinnamon, ginger, and corriander spices for the tangy flavor of horseradish. The original recipe makes a custard-like dish. For a firmer texture you can add more macaroni, up to a total of 4 lbs. That will yield a total of 64 servings. vegetables, beans, and smoked meat. Beans were one of the New World wonders brought back to Europe by the early explorers. At first they were so precious that even a few beans cost a fortune. But their popularity quickly spread until every gardener in Europe was cultivating multiple varieties of beans and other legumes. Beans are mentioned in Fariy Tales, show up in paintings, and are listed as ingredients in recipes often enough prior to 1600 that we can happily serve period dishes that include New World beans. This lovely stew comes from the North-central part of Italy where adventurous cooks were the early adopters of maize, tomatoes, and peppers as well. Soak beans in salted water overnight. Make a bouquet garni by tying the bay, thyme, and rosemary sprigs together with string. Fry onions in a large stew pot with olive oil. Drain beans and add them to onions along with stock and enough water to cover the beans about 2"; then, place over high heat. Add celery, turnip, parsnip, cumin, pepper, meat, and bouquet garni. Bring to boil; then, reduce to simmer for 2 hours or until beans are mostly tender. Remove boquet garni and add the carrots. Simmer until the carrots are bright orange and fork tender. Cut the stems from the collard greens. Wash the leaves, pat dry, and chop in large pieces. Add chopped greens a little at a time—pushing them under the surface—and simmer covered for another 15 minutes. Remove from heat and serve in bread bowls with a sprinkling of Parmesan cheese; or, for fewer servings of bread, serve over slices of toasted Italian bread drizzled with olive oil. Makes about 28 1-cup servings or 48 5-oz servings. Each whole recipe is equal to 34 servings of vegetables, 5 servings of meat, 2 servings of dairy, 16 servings of beans, and 1 serving of fat. If you want to add this article to your list of favorites or email it to a friend, please use this permanent URL, https://stores.renstore.com/-strse-template/0812A/Page.bok. Permission is granted by the author to quote from this page or use it in handouts as long as you include a link back to Renstore.com.